During one of my recent Fyrinnae splurges, I picked up their highly-regarded Pixie Epoxy to use with my mineral shadows. In the tube, it reminds me of when clear mascara goes rank! I used to buy clear mascara to set my brows, but it always went this cloudy consistency after a couple of months. Anyway, Fyrinnae’s Pixie Epoxy isn’t supposed to be a primer… it’s a foiling agent. Nothing to do with espionage and everything to do with making mineral eyeshadows extra purdy! 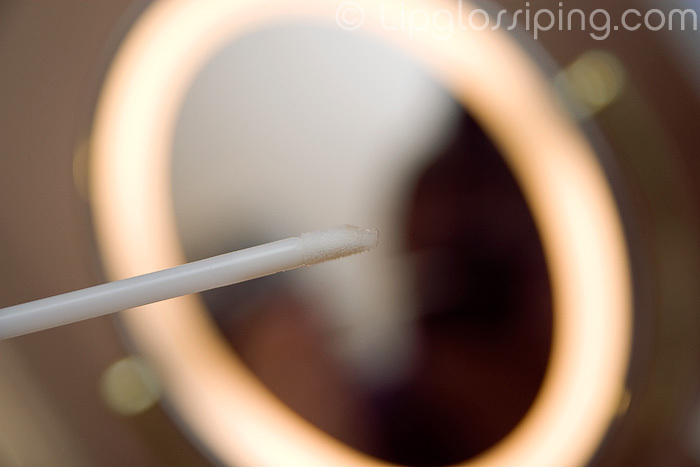 Slick some of this Pixie Epoxy over your eyelid… wait about 30 seconds and apply your mineral eyeshadow as normal. 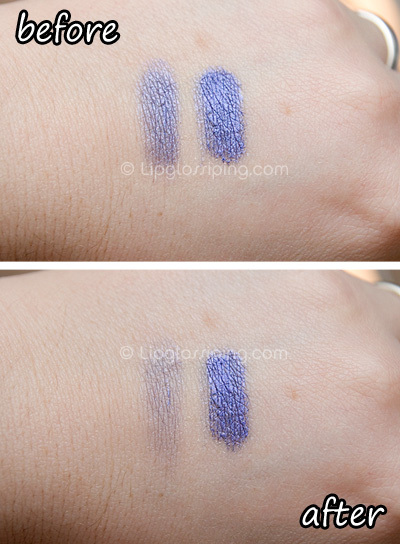 Fyrinnae advise that you use the teeniest amount you can manage… and for super staying power, apply it ontop of your usual eye primer. On the left is a mineral eyeshadow applied over bare skin, and on the right… the same eyeshadow applied over a small quantity of Pixie Epoxy. Look how much more vibrant it is! The bottom photo is after I did a single heavy-handed smudge in an attempt to dislodge the product. You can see that the Pixie Epoxy has great staying power. Have you tried Fyrinnae’s Pixe Epoxy? How do you make it work best for you? I love Fyrinnae’s Pixie Epoxy. I use it to make glitter stick on my eyes, it works so good! Pixie Epoxy, how I love thee. Let me count the ways….. I am so new to this fyrinnae: it feels like discovering a whole new realm of makeup. I heard of the word ‘epoxy’ before but I thought it was the name of a shadow. Oh my, a foiling agent, without having to mess about with diluting/mixing/spraying water(or whatever) with shadow to make it brighter? I don’t know any reason people would NOT want this. This sounds like a must to me, and I love the fact that you don’t mess your eyeshadow by spraying into it. The bright colours lovers in me absolutely needs it, and it really feels like one of those must haves. One question: When you say “applied under MINERAL eyeshadow”, does the shadow need to mineral to work? can i apply epoxy and then a regular pressed shadow on top? In my mind, when you said ‘mineral eyeshadow’ I’d read it as ‘loose shadow’ like barry M or something. This is exciting me. God, this is cute brand. Is fyrinnae starting to be one of the brands outside the UK that you like the most at the moment? So glad to hear you like it too, because I have some winging it’s way to me, along with some lip lustres after your lovely review on those with your first order 😀 I can’t wait! C’mon postie! I just ordered one yesterday Will only probably use it with really glittery eyeshadows rather than every powder ones. liloo: I think the epoxy was made with loose eyeshadows in mind, but I have used with cheap pressed eyeshadows and it worked. The only tipe of shadow that the epoxy doesn’t handle very well are matte eyeshadows. I am VERY happy with my Pixie Epoxy, it’s impressive what it does to loose eyeshadows, but also what it does for cheap eyeshadows that had very little color payoff. I am totally in love with this, lol. I adore my pixie epoxy, its just amazing! I really am going to have to buy some of this. I keep meaning to put in another Fyrinnae order, I just haven’t got round to it yet. I love the Pixie Epoxy, it’s amazing! I use it with both pressed and loose eyeshadows and it makes the colors so vibrant and stick to the lid better. I used to find it hard to blend eyeshadows over it at the beginning but that was only because I used too much product. Once I realised less is more and I only needed to apply a very tiny amount, blending wasn’t a problem anymore. It became very easy actually. 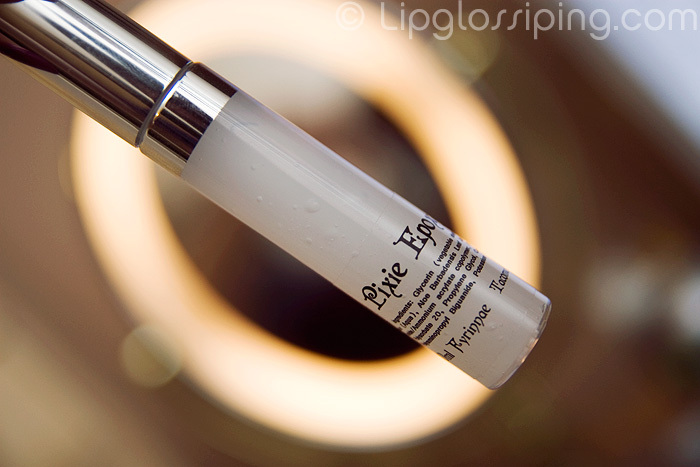 This product is not meant to be used as a primer, or as a conventional base. This isn’t Urban Decay primer or Too Faced Shadow Insurance. Nothing like them. Meaning no, you can’t blend shadows over it. It’s meant to be used as a sticky base. Pat the color on. Don’t swipe it on. Don’t ‘blend’ it. It won’t work. At all. You can use whatever you want over it, although it was designed to be used with loose products. Yes, you can use pressed shadows over it. But don’t expect them to blend. They won’t. They’ll stay stuck to the spot you applied them. And once again, PAT your glitter or eyeshadow, pressed or loose, over this product. It works bloody great as it was intended to. Fyrinnae has a very clear explanation & instructions regarding the usage of this product on their website, as another person mentioned. If people follow their instructions, they will get the effect intended.